error message: avrdude: stk500_recv(): programmer is not responding avrdude: stk500_getsync() attempt 1 of 10: not in sync: resp=0x54 avrdude: stk500_recv(): programmer is not responding avrdude: stk500_getsync() attempt 2 of 10: not in sync: resp=0x54 avrdude: stk500_recv(): programmer is not responding avrdude: stk500_getsync() attempt 3 of 10: not in sync: resp=0x54 avrdude: stk500_recv(): programmer is not responding avrdude: stk500_getsync() attempt 4 of 10: not in sync: resp=0x54 avrdude: stk500_recv(): programmer is not responding avrdude: stk500_getsync() attempt 5 of 10: not in sync: resp=0x54 avrdude: stk500_recv(): programmer is not responding avrdude: stk500_getsync() attempt 6 of 10: not in sync: resp=0x54 avrdude: stk500_recv(): programmer is not responding avrdude: stk500_getsync() attempt 7 of 10: not in sync: resp=0x54 avrdude: stk500_recv(): programmer is not responding avrdude: stk500_getsync() attempt 8 of 10: not in sync: resp=0x54 avrdude: stk500_recv(): programmer is not responding avrdude: stk500_getsync() attempt 9 of 10: not in sync: resp=0x54 avrdude: stk500_recv(): programmer is not responding avrdude: stk500_getsync() attempt 10 of 10: not in sync: resp=0x54 Problem uploading to board. See http://www.arduino.cc/en/Guide/Troubleshooting#upload for suggestions. You have a BT module attached to Arduino Tx Rx pins. That's the culprit. Disconnect anything from Tx and Rx pins of arduino while uploading code. Once the code has been uploaded, re-connect the BT module. Since this didn't solve your problem, you need to pin point the issue. If you have removed everything from Arduino and still not able to upload the code - either your drivers are not up to date or your arduino is faulty. Try uploading blinky sketch. Didn't succeed? Restart arduino IDE and try again. Didn't succeed? Restart PC and try again. Didn't succeed? Re install arduino and try again? Didn't succeed? Try on a friend's PC? No luck? Arduino is faulty. Note: This answer is for the exact schematic you have given. If you have done something else, there might be other reasons why you are not able to upload the code. Post a real picture of what exactly you are doing and we might be able to help you further. 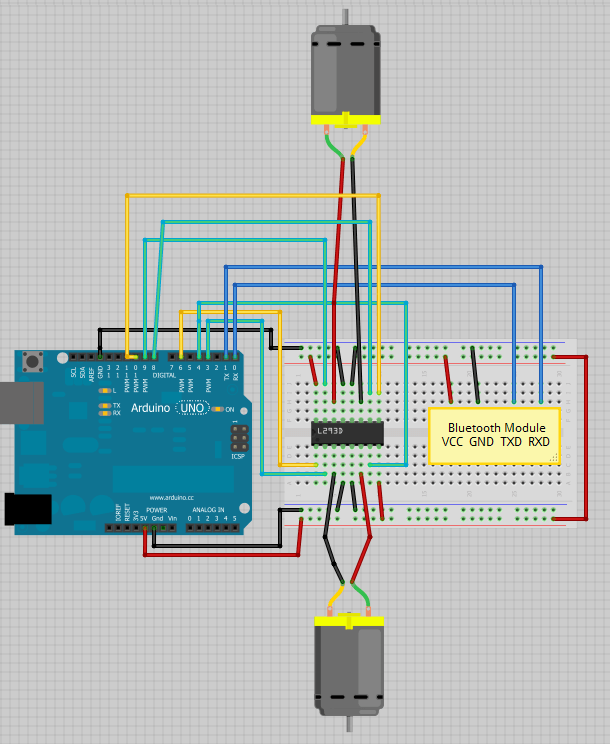 That schematic shows you are trying to power the motors from the Arduino's 5V power supply. That is a 'bad idea' unless they are good quality, low-current, motors. The electrical noise from the motors may cause the Arduino to reset, and run the same program from the beginning until it reaches the part where the motor's electrical noise resets it. Worse, current drawn if the motors stall may damage the Arduino's power supply. The Arduino's voltage regulator is supposed to protect itself from damage, but it doesn't always succeed. This is rare, but I have had students break it. I have elevated this comment to an answer to warn other people against trying to use the schematic in the question.